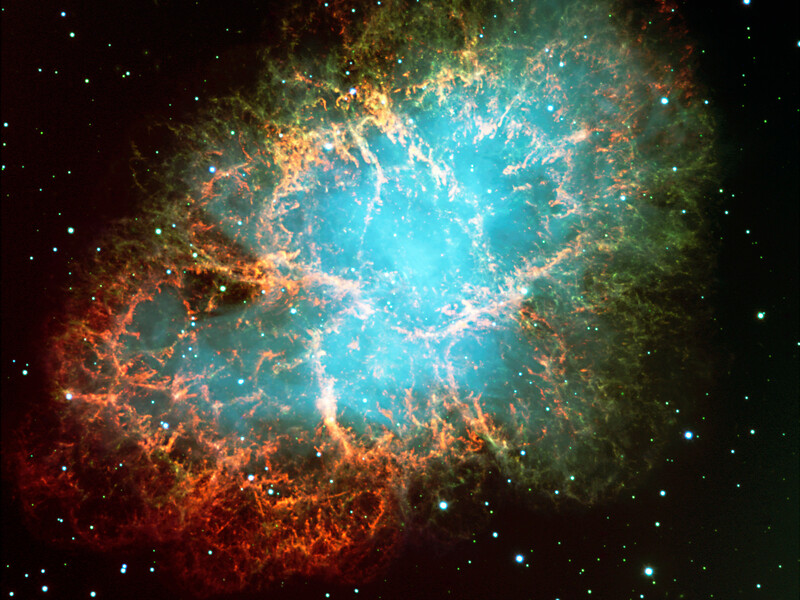 This photo shows a three colour composite of the well-known Crab Nebula (also known as Messier 1), as observed with the FORS2 instrument in imaging mode in the morning of November 10, 1999. 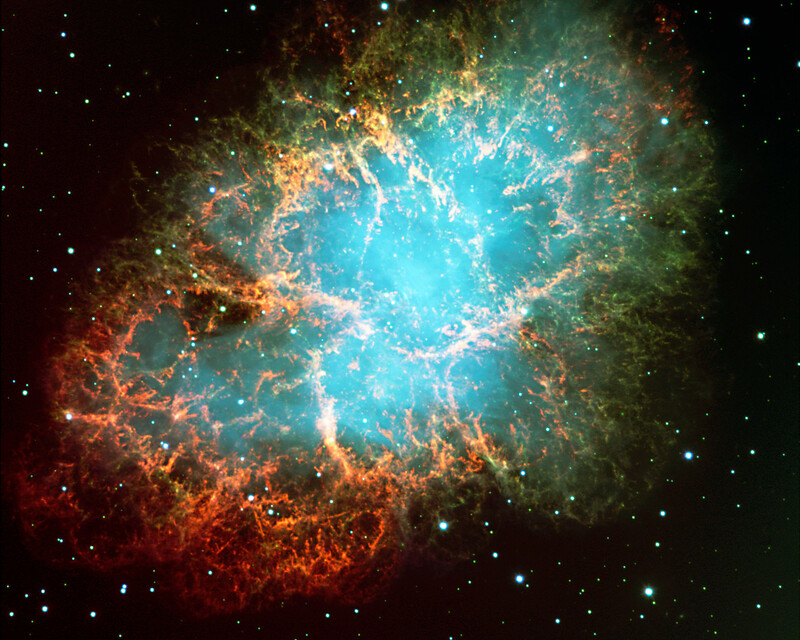 It is the remnant of a supernova explosion at a distance of about 6,000 light-years, observed almost 1,000 years ago, in the year 1054. 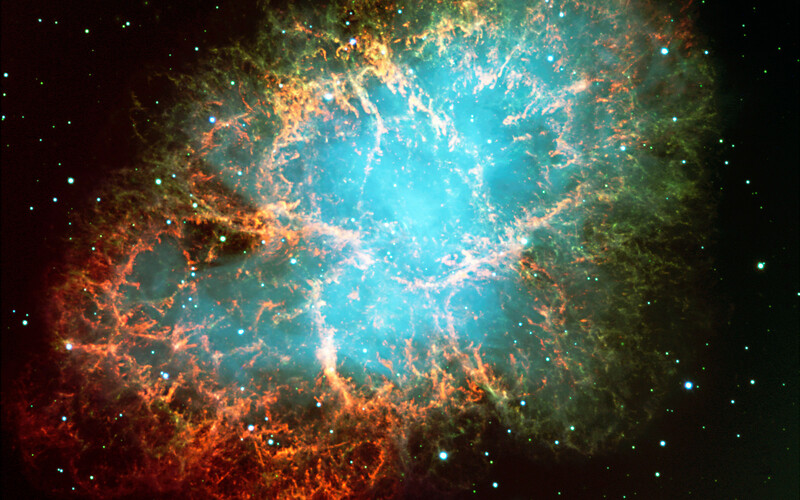 It contains a neutron star near its centre that spins 30 times per second around its axis (see below). In this picture, the green light is predominantly produced by hydrogen emission from material ejected by the star that exploded. The blue light is predominantly emitted by very high-energy ("relativistic") electrons that spiral in a large-scale magnetic field (so-called synchrotron emission). 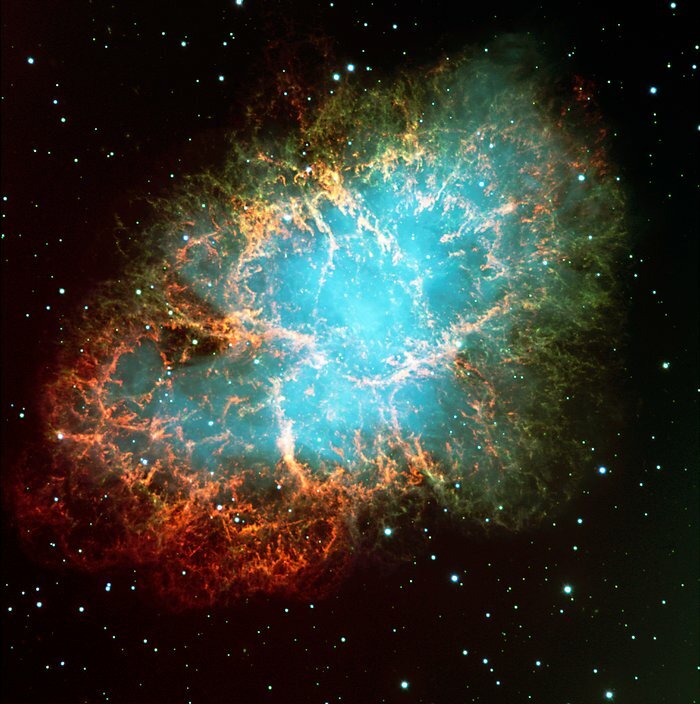 It is believed that these electrons are continuously accelerated and ejected by the rapidly spinning neutron star at the centre of the nebula and which is the remnant core of the exploded star. This pulsar has been identified with the lower/right of the two close stars near the geometric centre of the nebula, immediately left of the small arc-like feature, best seen in ESO Press Photo eso9948. Technical information: ESO Press Photo eso9948 is based on a composite of three images taken through three different optical filters: B (429 nm; FWHM 88 nm; 5 min; here rendered as blue), R (657 nm; FWHM 150 nm; 1 min; green) and S II (673 nm; FWHM 6 nm; 5 min; red) during periods of 0.65 arcsec (R, S II) and 0.80 (B) seeing, respectively. The field shown measures 6.8 x 6.8 arcminutes and the images were recorded in frames of 2048 x 2048 pixels, each measuring 0.2 arcseconds. North is up; East is left. Position (Dec): 22° 0' 51.38"